Cadbury’s Match & Win is back! Not only are there exciting offers from Cadbury’s in our depots this week! Plus, there is an opportunity for increased sales with the highly successful ‘Match & Win’ competition to further entice your customers. Available this week only, between 27th August & 2nd September 2018, there are several popular confectionery brands to choose from. There are huge POR’s to be made, with Green & Blacks bars generating 54.6% and other popular confectionery products helping you generate at least 30-40% POR. The Match & Win competition is set to be the biggest ever on pack promotion running from August until October and includes chocolate, biscuits and hot beverages this year. Mondelez have dedicated a spend of £4 million to support the campaign. So why would you want to miss out? Grab these fantastic products and start increasing your profits. Tell your customers about this great competition to encourage them to buy more of these sweet treats. The one stop shop for Independent retailers for Bigger Profits at Lower Prices. Come take a look at our competitively priced range of products at Dhamecha Cash & Carry. We are the largest members of Today’s group, which is part of the biggest buying group in Europe. We have 9 depots ideally situated and easily accessible in various locations around the London M25, Leicester and our latest depot addition in Birmingham. 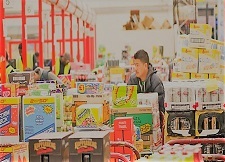 All of these locations are open seven days a week and stock over 12,000 products across the following key areas: Grocery, Soft Drinks, Confectionery, Toiletries & Household Goods, Wines & Spirits, Beers & Ciders and Tobacco. So come & take a look to find what you need under one roof and increase your profits. 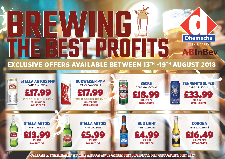 Stock up with the latest offers from AB InBev, a brand that brews the best beers using the finest, natural ingredients. There are deals on top brands including Stella bottles & cans, Budweiser & Bud Light, Becks, Corona and Tennent’s Super available only between 13th & 19th August 2018. Bud Light, which is one of the fastest growing beer brand’s in the UK and in the standard lager category appeals more to a young and affluent consumer with a repeat purchase rate of 37%. Take note of this useful tip to help grow your sales.